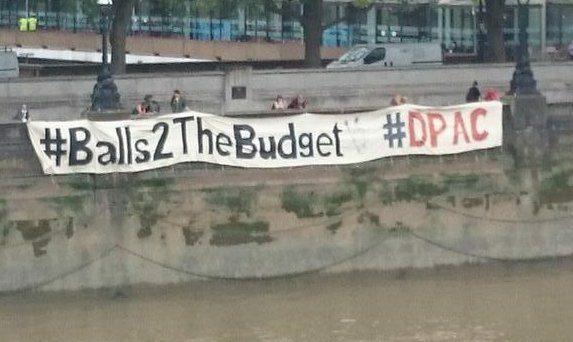 Massive Banner Dropped across the Thames opposite Parliament – reads “‘Balls2TheBudget #DPAC”. Photo by Kate Belgrave (@Hangbitch). The massive banner you can see above was made by the Banner Collective @blacbanner (Anna, Anton, Robin, Seamus and Sharon). DPAC are hugely grateful to them for making it for us in memory of @moriarty107 who passed away #RIP. DPAC also want to thank Class War, Streets Kitchen, Black Dissidents, London Latinxs, Columbian Women in Action, Occupy, Brick Lane Debates, Winvisible, London Black Revs, Reclaim Hackney, Camden Resists, Never Again Ever, Global Women’s Strike, People Before Profit and Fuel Poverty Action and all that supported us on the 8th for joining with us to make the day such a massive success. That fought with us upon #Balls2theBudget day.